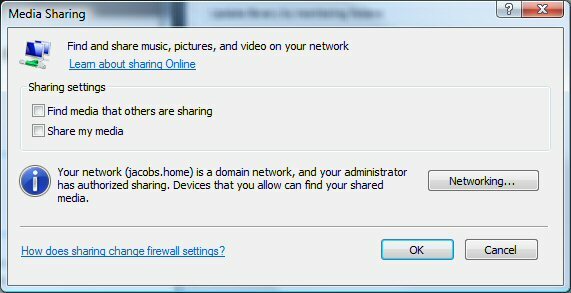 What some of you may or may not know is that consoles like the XBOX 360 and Sony PS3 all use a standard protocol for network media streaming. 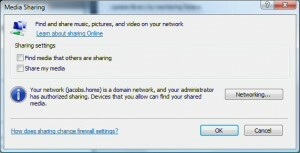 The name of this protocol is “DLNA” (Digital Living Network Alliance), essentially when you enable “share my media” in Windows Media Player this DLNA functionality is turned on (see below) and any devices supporting this form of advertising will automatically locate your shared media library. There is one snag, both the XBOX 360 and Sony PS3 have limits on the amount of supported media types, but don’t worry help is at hand! Whilst WMP is a great media player, there are alternative DLNA servers that will perform real-time transcoding of unsupported formats. This is performed by intelligence that detects the destination digital media player and transcodes these unsupported files on-the-fly.